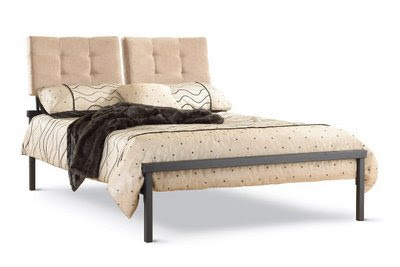 Dave and I ordered the Delaney Bed from Ecko Home Furnishings for our bedroom, and I'm pretty excited about it. (We needed a new frame pretty badly. The center of the old one was being held up by a stack of thick books, and it was a constant struggle to keep ourselves from rolling to the middle of the bed and smacking into each other.) Check out the headboard made of cushions....perfect for all the evenings that he and I sit and relax in bed, reading a book or playing on the laptop. Our frame will be an almost black hue, and our cushions will be a dark gray micro-suede-feeling material. It takes 6-8 weeks for delivery, because the one we ordered wasn't in stock. I can't wait for it to arrive!